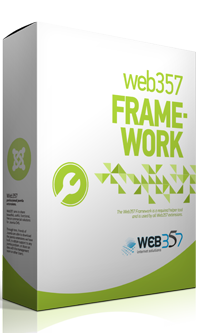 The Web357 Framework Joomla! plugin is a required helper tool that is used by all the Web357 extensions. Within the plugin files, we have included code and PHP functions that allow the plugin updates to be applied only in one place, i.e. the plugin itself, and ensure that they are rolled out automatically to any external site that is using the Web357 applications and plugins. + [Improvement] Move all assets to media/ folder at Joomla! root. # [Bug Fixed] An HTTPS error occurred after updating any extension. Update path does not exist. Error updating COM_INSTALLER_TYPE_TYPE_. + Add global elements for general use in Virtuemart extensions (the files "vmcategories.php" and "vmmanufacturers.php" have been added). ^ Change json's file path about extensions' information.
! Some unnecessary code in the "profeature.php" file has been removed. ^ CSS improvements for parameter fields with screenshots, like the Cookies Notification Bar plugin and the Support Hours module. ^ [Improvements] New parameter fields for the Cookie Manager functionality of the Cookies Policy Notification Bar - Joomla! Plugin. ^ [Improvements] New helper CSS classes for the screenshots in the plugin parameters of the Cookies Policy Notification Bar - Joomla! Plugin. # [Improvement] Load the Web357 product images from Web357's CDN to decrease the size of the zip file.
! [Deleted] Some elements have been deleted because are not used anymore in our extensions. ^ [Improvement] The date format inside the XML has been changed. Now is displayed like this "DD MMM YYYY", instead of this "YYYY-MM-DD". # [Improvement] New method to get the latest version. Fixes some errors after an extension installation on some servers with strong firewalls. + Web357 API Key: One single API Key for each Web357 Subscriber who has one or more active subscriptions at Web357.com. In order to update commercial Web357 extensions, enter your API Key in the Web357 Framework plugin settings. The key can be found in your Web357 account. ^ The Web357 Instagram and Youtube links have been added to the About Web357 tab info in extension settings. + A new button (Settings) has been added to the description tab for each Web357 component and plugin. # Demo and JED links have been updated. + NEW FIELD: A clock-style time picker has been added as a new element parameter field. For now, is used in the first beta version of Event Schedule Joomla! Component and Module. + We've added some helper functions for the Login as User Joomla! extension. # Bug Fixed: Some language strings are missing. + We've added some helper functions, like the "onContentPrepareForm", for the Cookies Policy Notification Bar Joomla! system plugin, to allow saving language strings even if the plugin is disabled. # Bug Fixed: The modal popup to display the screenshots inside the extension parameters (e.g. in supporthours module), at Joomla backend does not work. + A new form field element has been added to check if an extension is installed or enabled. This is useful for Monthly Archive component to detect whether the com_k2 extension is active or not, so to retrieve the content from there. + CSS Improvement: The "w357_xsmall_header" class has been added for styling purposes of the extra small headers at the extension parameters. # Some issues (blank page and template crashed, mostly) in extension's configuration/parameters that still use Joomla! 3.3.x, have been resolved. + The header element now supports CSS classes. + A link has been added to the "version checker" parameter field. It will redirect you to the update manager to get the latest version of an extension. ^ The URL of changelog will redirect you at web357.com, instead of displaying a modal popup window. ^ The language file has been updated. # jQuery Issues with View Changelog modal popup, have been resolved. ^ The loading at the back-end has been improved by replacing external social scripts (facebook, twitter, google+), with social icons. There are no scripts anymore, just images. ^ The file "elements_helper.php" is required also for the about.php element, for the CSS styling of social icons. ^ Improvement of "K2 Categories" element. # Bug Fixed: Now you can update more than one Web357 extensions at once. # BUG Fixed: The Customizer of Yootheme templates does not work properly if the Web357 Framework is enabled. ^ Clean up some code. + Web357 framework works as an installer for all extensions, instead of installing packages. + K2categories element has been added. # Bug Fixed: Some issues and jQuery conflicts with JoomGallery component, have been resolved. + 2 new elements added. + Link for the pro version has been edited. # Problem with language files. Renamed to filename-BKP.ini after installing the framework. # BUG Fixed: If "php_curl" is not enabled in PHP, the parameters cannot be displayed in administration panel. # BUG Fixed: If "allow_url_fopen" is not enabled in PHP, the parameters cannot be displayed in administration panel. # BUG Fixed: Some issues for Windows servers 2008 and 500 errors have been resolved. # Bug fixed: Problem with version checker. getCountry() : Detects the Country of a User. This function is based on geoplugin.net. getOS() : Detects the Operating System of a User (e.g. Windows, Linux, Android, iOS/OS, etc.). getBrowser() : Detects the Browser of a User (e.g. Firefox, Google Chrome, Safari, Opera, Internet Explorer etc. ).